By teaching jurisprudence (the science of “the application of law”) and pro se litigation (representing yourself in court) in schools, when an officer violates a civilian’s rights, for instance, and the State chooses not to hold the officer accountable, instead of having to resort to protest or relying on expensive attorneys they cannot afford, Citizens will already know how to apply The Federal Rules of Civil Procedure to exert their “right to Due Process” and utilize evidence (rather than mere accusation) to prosecute the officer themselves. This petition goes hand-in-hand with the petition to institute mandatory camcorders on government officials. This petition will be available on May 1st, 2018, at the beginning of our 2018 petition drive. Please come back on May 1! Above graphic saved on Pinterest by Barbara Martin. 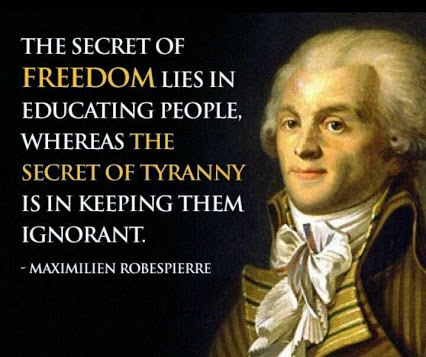 Notice: Although we agree with the above quote, we do not condone the actions of Maximilien Robespierre.